Ghost Browser lets you log into the same site as different users and is especially useful for VAs and people that manage multiple social accounts on Facebook, Pinterest, Twitter and others. This is probably the most unusual web browser you will come across and it is quite confusing at first, so expect to spend the first hour or two getting to know it. It is a bit of a mind bender to begin with. It is aimed at people that perform tasks across multiple websites, and those that need to login to websites with different accounts. Let’s say you are an admin on a website. You can be logged in as yourself as an admin, but on a second tab you can be a non-logged in member of the public, and on a third tab you can be logged in with a user account. Different tabs would therefore show different views of the website – admin, public and user. This is useful when developing membership sites, or when the view as an admin is different to that of a public visitor. It is also aimed at people that run multiple social media accounts. For example, if you have two or more Pinterest accounts, two or more Facebook accounts, several Twitter accounts and so on. You can log in as different users on different tabs. Suppose you are a VA (virtual assistant) with several customers, you may need to log in to social networks like Facebook, Twitter, and Pinterest as different people or identities. You can do this on tabs in Ghost Browser and you can save a set of tabs as a task. You don’t need to log in and out to switch accounts, you just select the tab you want. Some demo tasks and tabs are provided, but they can be deleted to create your own. Mouse over items and click the three dots for a menu with a delete option. A task is a set of tabs and there can be several tasks (sets of tabs). Click the plus button to the right of the Tasks heading in the sidebar to create new tasks. For example, you could have a set of social media websites on tabs in one task and a writing tools like Google Docs, Grammarly, and Wikipedia as tabs in another task. Click a task to select it and all the tabs appear. For example, click the task with social media sites and they all appear on tabs. Click the task with the writing tools and the set of tabs associated with them all appear. By creating tasks with sets of tabs, you need only click once to begin working on a task with all your resources open. You can also switch between tasks (sets of tabs), with a mouse click. 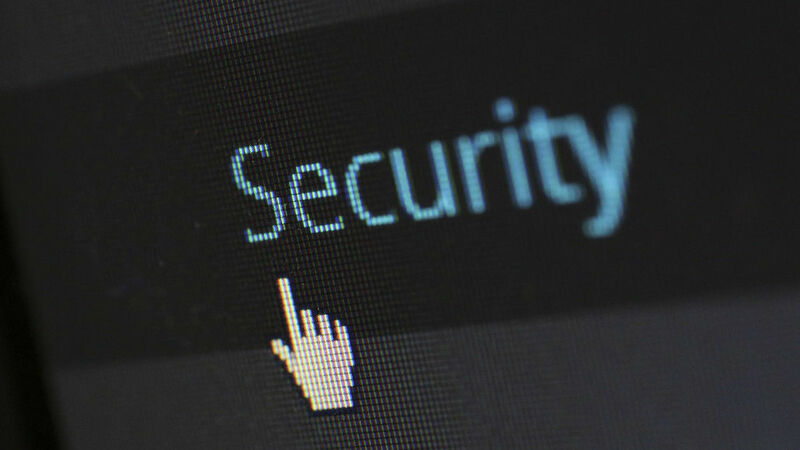 Normally with a web browser you can log into a website like Twitter with a username and password. To login as someone else you must log out and then login with a different username and password. This is tedious and slow for people that manage multiple accounts, so Ghost Browser lets you create new sessions on tabs. It is hard to explain, but think of it like this. Suppose you had two computers and opened a web browser on each one and browsed the web. Each computer would have a separate session – the history, cookies and so on would be different. If you logged into Facebook, Twitter, Pinterest or even your own site on one computer, you would not be logged in on the other computer. In fact, on the other computer you could login with a different username. Sessions are a bit like that. 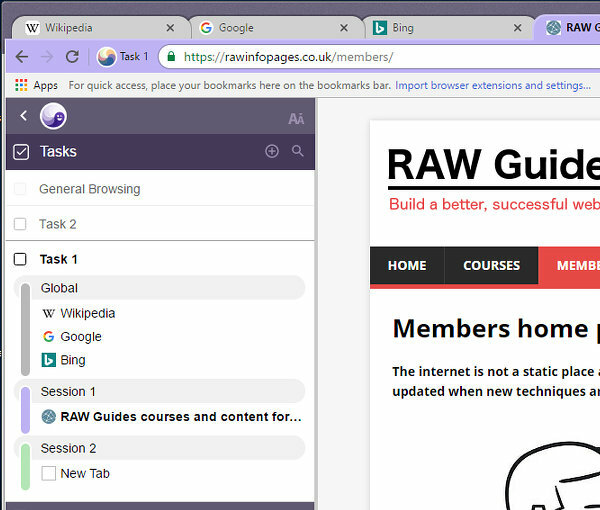 Create a new session and a new tab opens, but it may as well be someone else with a different web browser on a different computer. Create a new session and you can log in to a site with a different username and password. So on one tab you could be logged in as Bob Smith and on another tab you could be logged in as Sue Jones. This is handy if you manage multiple accounts on social media or on other websites. Suppose you are a VA and you manage the Twitter accounts of several clients. You could create a task and name it Twitter, and create a different session for each client Twitter account. One click on the Twitter task name opens all the tabs with all the sessions with all the accounts logged into. Is Ghost Browser for you? Do you really need Ghost Browser? For some people Ghost Browser is a great time saver that lets you focus on the tasks you need to do each day, and to handle multiple accounts at sites. It is not for everyone, but bloggers, VAs, marketers and so on, while all find it useful. The browser is based on Chrome, so web pages appear identical and the speed should be the same too. It is basically Chrome with a different set of menus. In the free version of Ghost you are limited to three tasks, but subscribers can create unlimited tasks. For free you can create three sessions per task, but it is unlimited with a subscription. You will find a Free/Paid comparison chart at the Ghost Browser website. 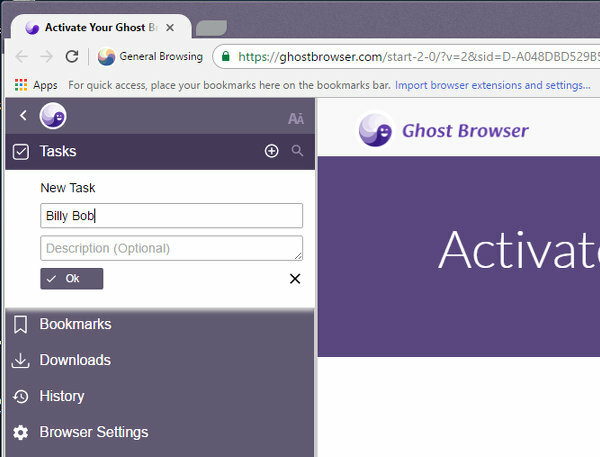 Prepare to be confused when you first start using Ghost Browser because it takes a while to get used to it. However, it could turn out to worth the effort. Very interesting. I had no idea that this was possible. Thanks for the information. Thanks for the review! I’m one of the co-founders of Ghost Browser. I’m sorry to hear you felt it was confusing at first. I’d love to know your thoughts on what you think we could do to improve the on-boarding experience. I’m on Twitter @CatKokoszka. Please feel free to reach out! I didn’t understand it at first and it took some time to work out what on earth was going on. I had to experiment with it to discover, almost by trial and error, what the browser was doing. What it does is good, but there must be a simpler way of doing the sidebar interface.